Black Friday and Cyber Monday were the biggest eCommerce days of 2018. Source: Shutter Stock. Over the past decade, online shopping has increased in popularity with many people now preferring to search for new items from the comfort of their homes rather than trailing around the shops to hunt down a bargain. However, while the lead-up to Christmas used to be the most popular time of year to hit the virtual shops, a new report has revealed that the majority of Australians actually splash the cash online on the sale days dubbed Black Friday and Cyber Monday at the end of November. The report, titled Inside Australian Online Shopping, was compiled by Australia Post and revealed that the two discount shopping days – which originated in the United States – now tempt more Aussies online in the run-up to Christmas to begin their festive shopping early, with the period experiencing growth of 28.7 per cent in the last calendar year. Black Friday and Cyber Monday, which typically see retailers slashing their prices across the board, eclipsed the first two weeks in December to become the biggest eCommerce days of 2018, also followed by the End of Financial Year Sales, Boxing Day Sales and May Mayhem. 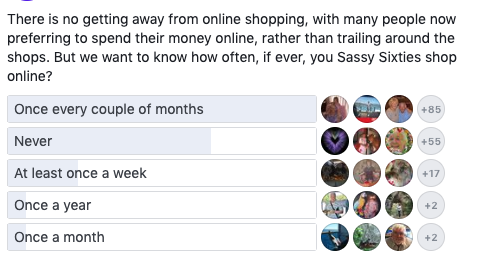 The overall number of online purchases in Australia increased by more than 20 per cent over the past 12 months, however it seems over-60s are still dubious when it comes to shopping on the Internet, as a poll of the Starts at 60 community revealed how often they shop online. Almost 200 people took part in the survey which revealed that, while many older Australians do shop online, it’s still something of a rare occasion, as 50 per cent of respondents said they only shop online once every few months. And a whopping 33 per cent of readers admitted to “never” shopping online at all. Very few Starts at 60 readers are regular online shoppers, with just 3 per cent shopping online once every month, and 11 per cent purchasing goods online on a weekly basis. Their reluctance to trade physical shopping for online was mainly down to issues over not being able to see and feel the products for themselves, with some reporting bad experiences with poor sizing or quality in the past. Almost 200 readers took part in the poll. One reader said: “Tired of being ripped off, wrong sizes, stuff that is is not what is shown, rubbish that is broken, too difficult to send back, costs too much, so no, I try to stay away from it.” Another agreed, writing: “I feel the same way. I too have just about stopped buying clothes online, don’t buy shoes either.” While another said they do shop online, but only purchase from local businesses. Read more: ACCC warns of rise in online shopping scams. Last year, the Australian Competition and Consumer Commission issued a warning about online shopping scams, calling on Aussies to exercise caution when thinking about purchasing something they’ve seen on social media. Deputy chair Delia Rickard told 3AW it was incredibly common for people to be caught out by fake ads on sites like Facebook, adding that the fastest growing area of scams is online shopping. Do you shop online regularly? Are you worried about the security of your personal details online?